Nafshenu Orchestra has grown into the most prestigious, well-known Jewish Orchestra inthe United States. They specialize in musical versatility and perform all styles of Jewish and contemporary music. MTM took their old, flash-based site and turned it into an updated, easy-to-use, modern website with responsive design and database-driven content. Visit the site at www.nafshenu.com. The Gifts Within turns special invitations into beautiful keepsakes. MTM created a beautiful and easy-to-use website to showcase their extensive and creative portfolio. Visit the site at www.thegiftswithin.com. Sprayground is an exclusive lifestyle brand selling deluxe backpacks and accessories. Since their products are constantly changing, MTM provides ongoing cutting-edge programming and fresh, high-quality responsive design that adapts to mobile devices and all screen sizes. MTM also produced an online product catalog, revised the company colors and seamlessly integrated several tumblr blogs. Visit the site at www.sprayground.com. Creoh is an international company with over 20 years of experience in retail displays and packaging, designing and developing top-shelf displays for the largest retailers in the USA. Creoh wanted a site that would introduce respective customers to their wide range of products and virtually limitless design options. MTM created a beautiful website, complete with slideshows and several photo galleries. Visit the site at www.creoh.com. John Morgan, America's best known hypnotherapist, conducts personal improvement seminars in smoking cessation, weight loss, stress management, sales training, and personal growth. John Morgan needed a website redesign and MTM provided an attractive, clean and direct Magento website which sells his main products easily and successfully. Visit the site at www.johnmorganseminars.com. Traffic Logix provides traffic calming solutions to slow or reduce traffic. Their patented products, including radar speed signs and speed humps, have enhanced safety for pedestrians and motorists in many major cities worldwide. MTM completely redesigned their website, beginning with a full reassessment of the information architecture and their SEO visibility. MTM's marketing team focused on increasing leads and conversions, and guided the design team to create a site which is both a pleasure to view and easy to navigate. Reports from MTM's post-dev marketing and SEO strategists are that leads are at an all-time high, and the conversions have multiplied exponentially since the redesign. Visit the site at www.trafficlogix.com. 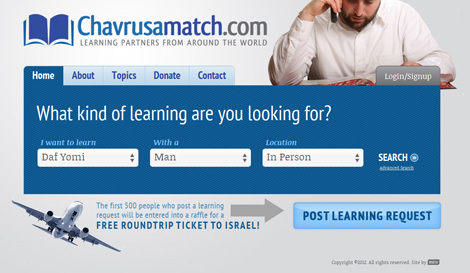 Chavrusa Match’s mission is to connect people for the purpose of learning Torah. MTM created a beautiful, easy-to-use website that allows people to create accounts or log-in with social media. They can then set their preferences, post a learning request, or search the site for appropriate learning partners. 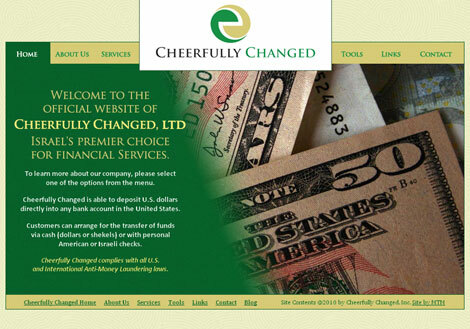 The site includes a custom-built cms which makes the site easy to update and maintain. Visit the site at www.chavrusamatch.com. Ateret Yerushalayim, a unique post-high school program in Jerusalem, requested a website redesign that, while professional and clean, would portray their focus on a warm, relaxed atmosphere for their students. MTM created a beautiful website that is both user-friendly and easy for the clients to update themselves. Visit the site at www.ateret.org. Beacon CPA is an accounting firm with clients ranging from small domestic corporations to international giants and works with all forms of corporations, trusts, individuals and estates. Beacon CPA commissioned a site redesign and MTM presented a clean, inviting and professional website, along with a custom-built cms, seo optimization, and expert copywriting. Visit the site at www.beaconcpa.com. Sprayground is a company with an art-inspired backpack line. MTM created functionality for the "store locator" page, including a custom-built module for Magento that creates the front-end store locator and also built a back-end for managing the locations. The store locations are also integrated with google maps. Visit the page at www.sprayground.com/locator. Rebecca Shore's art is instantly recognizable with a fusion of colorful imagery, ink stitching and 3500 year of Jewish tradition that has become her well-loved style. Her work combines her passion for Judaism with her flair for colorful, enchanting visual design. MTM created an ecommerce site with options to purchase artwork world-wide. The website design is true to Rebecca's whimsical style but keeps to a modern look-and-feel, including a dynamic slideshow on the homepage. Visit the site at www.rebeccashore.com. The IKO is a new kosher certification agency specializing in the certification of raw materials and ingredients in South and South East Asia. MTM created an eye-catching, clean-looking and easy-to-use website which explains the kosher certification process and invites potential clients to submit an application or contact the company for further information. The site also boasts three pages in Chinese, Japanese and Malaysian. Visit the site at www.ikokosher.com. MTM created a personal website for singer/songwriter Shlomo Katz to showcase his life's work, including videos, music samples and spiritual writings. The design is soulful, yet functional, and also includes a shopping cart so users can purchase CDs or downloads of Shlomo's music. Visit the site at www.shlomokatz.com. United Staffing Solutions is a recruiting firm focused on placing full-time employees and consultants in Information Technology, Finance Accounting and Human Resources. MTM designed a sharp, clean, businesslike site for the purpose of matching employees and employers in a wide range of job opportunities. Visit the site at www.utdsolutions.com. 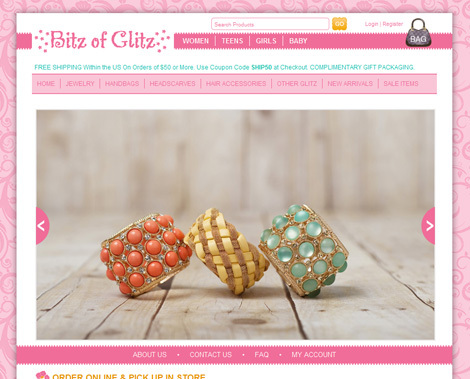 Bitz of Glitz is a fashion-forward boutique that sells jewelry and accessories. Starting with a design from www.upperleveldesign.com, MTM built a robust ecommerce solution to complement the existing brick and mortar store. The CMS is easy to use and update and the navigation is clear and user-friendly. Visit the site at www.bitzofglitzonline.com. American Yogini offers information and resources that carry yoga practices off the mat and into every part of life. They specialize in raw juice fasts and cleanses, yoga and juice retreats, and holistic and healing beauty products. 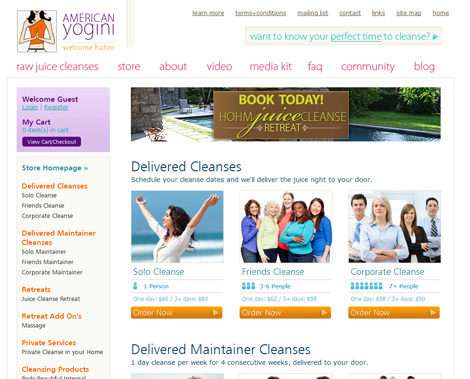 MTM created a new shopping site for American Yogini while keeping the look-and-feel of their existing main site. The shopping site includes a fully-equipped back-end with custom built code used to support their many different products and product options. The CMS is easy to maintain and the front-end features a beautiful and clean design, allowing visitors to easily purchase products and reserve retreats. Visit the site at www.store.americanyogini.com. 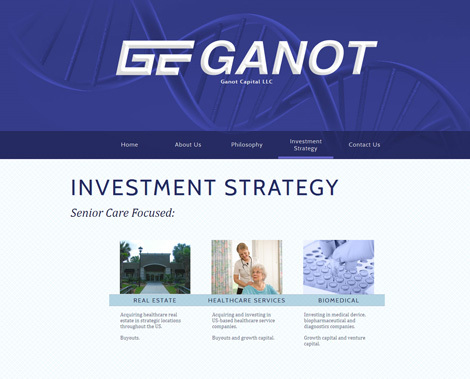 Ganot is an investment company with a portfolio that spans across the senior care sector and includes real estate properties, healthcare service companies, medical device companies and biopharmaceutical companies. MTM designed a user-friendly, direct and up-to-date informational website which showcases Ganot's investment strategy, philosophy, and invites potentials investors to contact them using an email form. Visit the site at www.ganotcapital.com. Diamond Pursuit is a successful brick-and-mortar store that sells only well cut high quality certified diamonds at competitive prices across the USA. In response to a need for an online presence, MTM created a streamlined and easy-to-use Magento e-commerce store. 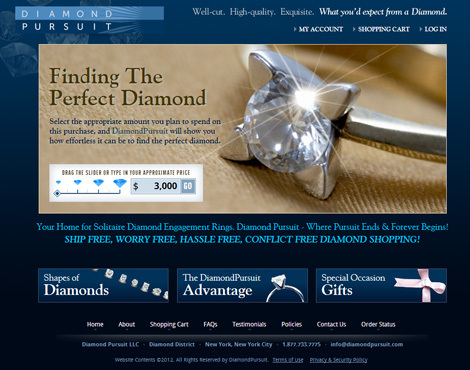 Visit the site at www.diamondpursuit.com. CREF Advisors is a full-service commercial mortgage brokerage company specializing in multi-family and cash-producing commercial properties. MTM created a polished, professional website for CREF Advisors which showcases their recent transactions, as well as providing a mortgage calculator and more information about their company. Visit the site at www.crefadvisors.com. Avante is a network of health-care facilities across the US east coast. They turned to MTM for design and website development. Starting from a excellent design by Matt Granat of granatdesign.com, we provided an automated applicant tracking system for managing Avante's 10,000+ job applications. MTM also delivered a content management system, complete with video tutorials, for comprehense management of all website content. Visit the site at www.avantecenters.com. Majestic Retreats features incredible food, beautiful accommodations and exciting family activities throughout their annual Passover program. MTM created an attractive and easy-to-read email newsletter template as an advertising campaign for Majestic Retreats. Click here to view all the newsletters. The Senator Ben Cardin Jewish Scholars Program is a joint venture of NCSY, JSU, and Inspiration Express. The program's goals are to connect capable, inspired Jewish youth with Jewish leaders who can further inspire and mentor them. MTM created a one-page website enabling applicants to submit their personal details and essays over a secure server, in order to be considered for the program. Visit the site at www.cardinscholars.com. WhyShlepIt is a one-stop online shop for all bath and bedding needs in Israel. They provide great prices, top of the line quality merchandise and speedy delivery. MTM designed a fun, user-friendly website, and implemented an easy-to-use and extensive content management system which includes various product options and shipping modules. Visit the site at www.whyshlepit.com. Yeshiva Tiferet (or TJ, as it is nicknamed) is a post-high school program for boys in the Bayit VeGan neighborhood of Jerusalem. MTM re-designed and updated their website to include an attractive look-and-feel, password-protected alumni section, image slideshows, text blogs, mp3 downloads, secure online application, community blogging features, and an extensive back-end. This is one site in a large network of sites which includes donation and payment features. Visit the site at www.yeshivatiferet.com. MTM designed a beautiful CMS template for Talk n'Save, a cell phone company in Israel. This template enables Talk n' Save to offer different customized cell phone packages to all types of Israeli tour groups. Rabbi Yitzchok Dinovitzer has always has a G-d given knack for storytelling. After much demand, he finally recorded some of his greatest stories and set them to soothing background music. MTM created a kid-friendly and easy to navigate e-commerce website so parents and people of all ages can purchase his wonderful CDs. Visit the site at www.jewishkidstories.com. Nancy Lee Moran is a romantic realist artist, who needed a website to showcase her work and blog. MTM worked with Nancy's original paintings to produce a gentle, artistic website and Wordpress-integrated blog. Visit the site at www.nancyleemoran.com. 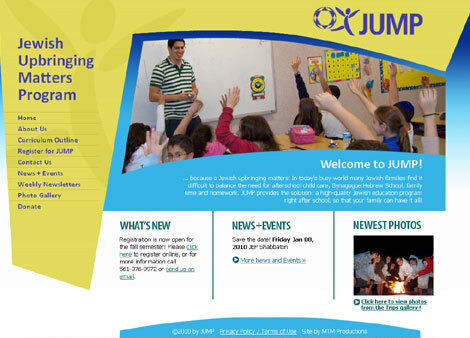 JUMP stands for Jewish Upbringing Matters Program, and is an organization that provides Jewish after-school classes to public school students in South Florida. JUMP is a project of Afikim Foundation. JUMP requested a bright and exciting site, inviting parents to sign up for their program. MTM also incorporated an extensive back-end, complete with photo gallery capabilities. Visit the site at www.jewishafterschool.com. Shabbos Kodesh offers fresh, delicious food for Shabbat from two major caterers in Jerusalem. MTM created a beautiful and user-friendly e-commerce solution to allow customers to shop for individual food items or buy ready-made meal packages. Visit the site at www.shabboskodesh.com. The Heshe and Harriet Seif Jewish Learning Initiative on Campus (JLIC) program helps Orthodox students navigate the college environment and balance their Jewish commitments with their desire to engage the secular world. MTM was given a site design in images and from those jpgs, created html templates and then integrated the code with the JLIC previously-populated Expression Engine CMS. Visit the site at www.jliconline.org. JCC Maccabi needed an attractive design to drive athletes and their families to register for the Baltimore 2010 Games & ArtsFest. MTM designed a beautiful, immersive site, which includes a dynamic and extremely flexible customized CMS. The site also includes many features such as jquery and flikr slideshows, a countdown timer, and dynamically displayed content based on the day. Visit the site at www.baltimore2010maccabi.org. Following the branding look-and-feel previously created by MTM, we designed a landing page template used for all of Touro College in Israel's various courses in order for TCI to gauge interest in particular classes enable them to compile a list of potential students. Acharai is a non-profit organization based in Baltimore, who's focus is to bring together Jewish leaders from all over the Jewish spectrum in order to promote dialog and build on their commonality. MTM delivered a professional-looking website and custom-built content management system that can be managed and maintained directly by their company. Camp Milldale provides a safe, fun and nurturing summer camp, which promotes positive Jewish values and experiences. Athletic, artistic and cultural activities create lasting memories and friendships, all within a beautiful natural setting. The Camp Milldale redesign is bright, happy, and kid-friendly. Most importantly, the site is easy to use for prospective parents and returning campers alike. Visit the site at campmilldale.org. Zoticon is a biotech investment firm specializing in products with unmet medical need. MTM redesigned their corporate website, giving them a streamlined and more professional image. Visit the site at www.zoticon.com. Penny's Chanukiot is a website which showcases the artistic work of Penny Harow. She creates and crafts whimsical and beautiful chanukiot from various materials, toys, and household objects. MTM created a simple but attractive website in order to display her work, view client testimonials, and buy her newly published book. View the website at www.pennyschanukiot.com. Yesha Israel is a pro-Israel news site, dedicated to reporting important information in real-time, as well as facilitating help for Israelis impacted by the recent terror and expulsions. MTM created a modern and user-friendly website which allows for access to large amounts of information, and incorporated a back-end which easily allows the client to update their site as often as they wish. Visit Yesha Israel at www.yesha-israel.org. Various HTML advertisements for The Afikim Foundation. 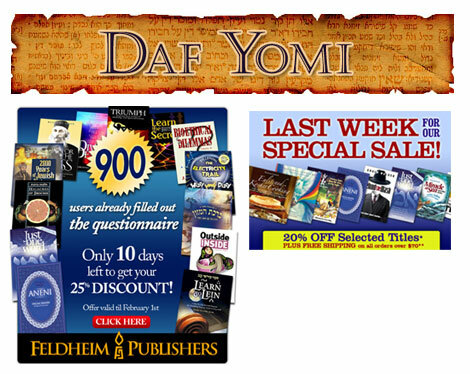 Includes their ongoing Daily Dose of Torah book series campaign, Rabbi Baruch Chait's book series, the Chanukah campaign, and an ad for their new Kotel among others. Hankie Couture needed a website to showcase their beautiful original collection of doll-size fashions, meticulously handcrafted from a single vintage handkerchief. Working off the logo and website design by Joy Chu, MTM programmed an e-commerce site which allows customers to view and buy the clothes, as well as learn more about the company. Visit Hankie Couture at www.hankiecouture.com. Touro College in Israel provides the opportunity to benefit from the advantages of a leading North American academic institution while studying or living in Israel. To date, Touro Israel has provided hundreds of students with the opportunity to further their higher education in disciplines geared towards highly productive and profitable careers -thus ensuring that their time in Israel provides the maximum benefit as they look ahead towards the future. Touro College in Israel needed a site that would provide detailed information on the array of classes they offer, as well as provide existing and potential students a means of communication with the school. MTM created a beautiful website which includes an email form, various schedules and course descriptions for every part of their extensive program. Visit the Touro College in Israel website at www.touroisrael.org. The Afikim Foundation contracted MTM to redesign their online store, where they sell books and other Judaica. MTM created a new store with easy-to-use back end capabilities, as well as a beautiful design and clear navigation to make for a seamless shopping experience. Visit the new Afikim Foundation store at www.afikimfoundation.org/store. BRGNY, a realtor in New York, manages properties in a number of areas. The client needed a central location in order for their company and employees to manage all the properties and the information they have for each one. They also stipulated a need for separate interfaces for owners and employees. MTM designed an easy to use AJAX-powered web application that allows BRGNY to effortlessly compile the information they need in order to manage their properties and satisfy their clients. Standing Together is a non-profit organization dedicated to supporting Israeli soldiers on active duty. Totally funded by donations from Jews throughout the world, Standing Together acts as a bridge between Israel and other Jewish communities and creates feelings of unity and support. MTM created the Standing Together website as a means of spreading the word about this important organization. The website includes information about the organization, a gallery of images, videos, press releases, and a donation page. Visit the Standing Together website at www.stogether.org. ToTal is a series of Jewish educational programs with branches all over North America. Under the auspices of the Afikim Foundation in New York, they conduct Sunday-morning Jewish schools and do a great deal of outreach for Orthodox Jewry. ToTal has developed a uniquely imaginative and original package of ideas and materials for schools and Shuls to readily create community-wide Mitzvah Fairs which will not only attract crowds, but will educate kids and adults alike in an enjoyably creative way. MTM has created a secure CMS-driven portal for ToTal educators to access this valuable information. The site has received rave reviews at educational conventions. Your Israel Tour Company offers a unique, personalized Israel touring experience. Specializing in groups and families, they handle every aspect of the trip, from flights and hotels to tour guides and restaurants, and much more. MTM designed a beautiful, user-friendly website as a means for potential clients to view the wide range of services they offer. The website also includes a photo gallery which displays recent photos of group trips. Visit the site at www.yourisrael.co.il. After marveling over their MTM-designed parent site, www.lubicom.com, Lubicom Marketing commissioned MTM again. They requested a special site dedicated to specifically showcasing the work that Lubicom does in the Kosher food industry. MTM designed and programmed Lubicom Kosher, which includes a blog and online magazine. Visit the site at www.lubicomkosher.com. Under the guidance of Rabbi Yaacov Haber, TorahLab is bringing together educational and media specialists to create dynamic Jewish learning experiences for adults of all backgrounds and levels. These outstanding programs, ideal for school curriculum and home study, form an exciting new approach to Jewish learning. The TorahLab curriculum presents a comprehensive course of study for exploring the breadth and depth of Judaism. MTM created this expansive website and gave the client direct access to the site, where they can easily add and change information on an ongoing basis. The look and feel is fresh and professional, and the navigation is very user-friendly despite the wealth of information that the site houses. Visit the TorahLab website at www.torahlab.org. Lubicom Marketing Consulting is dedicated to serve growth-oriented businesses and organizations with sound strategic planning and expert execution of marketing programs. It believes that the best managed companies and ultimately the most successful, focus on their strengths and yet are flexible enough to deal with change. As a strategic marketing firm, Lubicom Marketing Consulting seeks to help its clients progress to the next level in reaching its targeted market, delivering its desired message, and in securing its ultimate positioning and branding. MTM created Lubicom's website as a means to showcase their extensive portfolio, as well as articles, press releases and a weblog of wisdom from the company's CEO. Visit the Lubicom website at www.lubicom.com. Israel Special Kids Fund is a non-profit organization established in 1998, and is dedicated to improving the quality of life for disabled and seriously ill children, as well as their families, in hospitals and rehabilitation centers in Israel. MTM designed an attractive informational site that provides English-speaking people access to information about the organization, as well as an image gallery of recent programs and a secure donation page. Visit the Israel Special Kids Fund website at: www.israelspecialkids.com. The Casterboot is a durable boot made of Aluminum or Nylon/ Fiberglass Composite. It features a urethane wheel that slides easily over furniture legs and is secured with a turn of a tension bolt, allowing even the heaviest pieces of furniture to be moved with great ease and without any long-term modification. MTM created the Casterboot e-commerce site to easily allow the purchasing of any Casterboot product, along with detailed information of all the products available. The site includes a content management system that allows the company to add, remove and edit products with only a few clicks. Visit the Casterboot website at www.casterboot.com. Template for Dessert Today, the official newsletter of the Great American Dessert Expo. White House Hardware sells mechanical and electrical equipment for plasma televisions. MTM designed an clean, engaging store for them to promote this new venture. In addition to a comprehensive storefront with customer account access, the site features an easy-to-use administrative control panel. AVTV is cutting-edge media for healthcare professionals. Currently in many doctor's offices, AVTV provides flat-screen televisions and customizable content to enrich the waiting-room experience. The site plan is to allow doctors to log in online and select whatever content is most appropriate for their installation. MTM created a first-stage informational site powerful enough to allow for service subscriptions. The Jewish Soldier Foundation is a non-profit organization dedicated to serving the Jewish men and women who daily risk their lives defending freedom and democracy. It was established by Joe Kashnow, a Jewish soldier wounded in Iraq who wanted to show praise and gratitude to G-d who kept him alive through such an experience. MTM created a well-designed informational website, complete with a secure donate page, guestbook, and mailing list sign-up, making JewishSoldier.org an indispensable resource for Jewish soldiers in the US Military and their families. Visit the Jewish Soldier Foundation website at www.jewishsoldier.org. For www.feldheim.com, various banners and email ads. Simcha Layeled is a non-profit organization, established in 2004, dedicated to improving the quality of life for disabled and seriously ill children, as well as for their families in hospitals, rehabilitation centers and homes. Children with serious illnesses often undergo treatment requiring long, debilitating stays in the hospital. Even when the child returns home, he or she may need assistance. Parents can become overwhelmed by the constant care they must give their child, especially with other children at home. The staff and volunteers of Simcha Layeled go to the hospitals to play with the children, read to them, feed them and help them with their school work. They also visit the homes in order to help the children, prepare meals and assist in therapy treatments. MTM designed Simcha Layeled's website, which features informational pages as well as a dynamic photo gallery and content management system. The site is almost exclusively in Hebrew. Visit Simcha Layeled at www.simchalayeled.co.il.